I’m too lazy to make pie. Well, not all the time, but most of the time. And when I do make it sometimes I’ll cheat and use a store-bought crust. 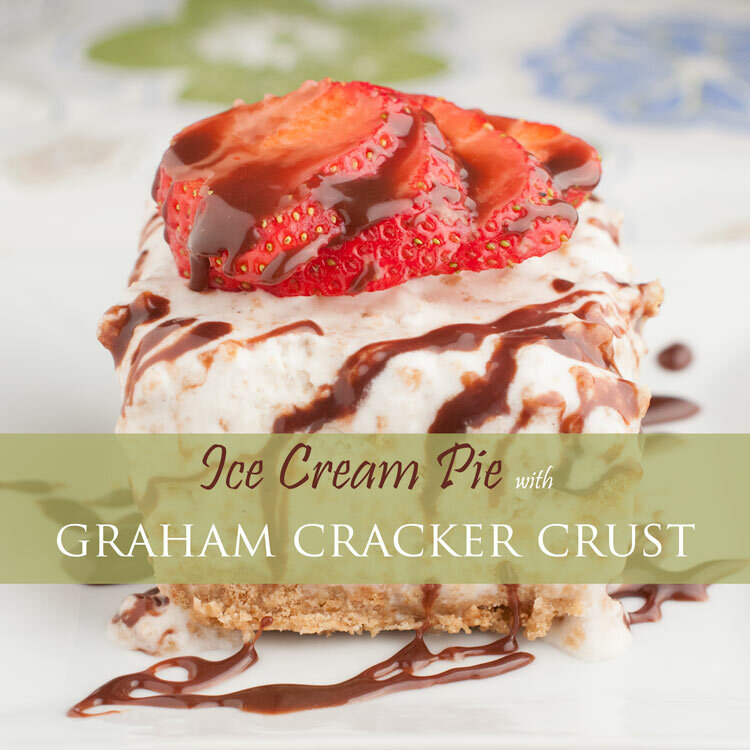 I love pie, but why make pie when it’s just so easy to make crisp? 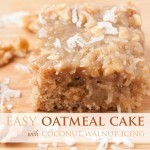 You just whip up the topping in a food processor and throw it on top of the fruit and then bake. That’s it! 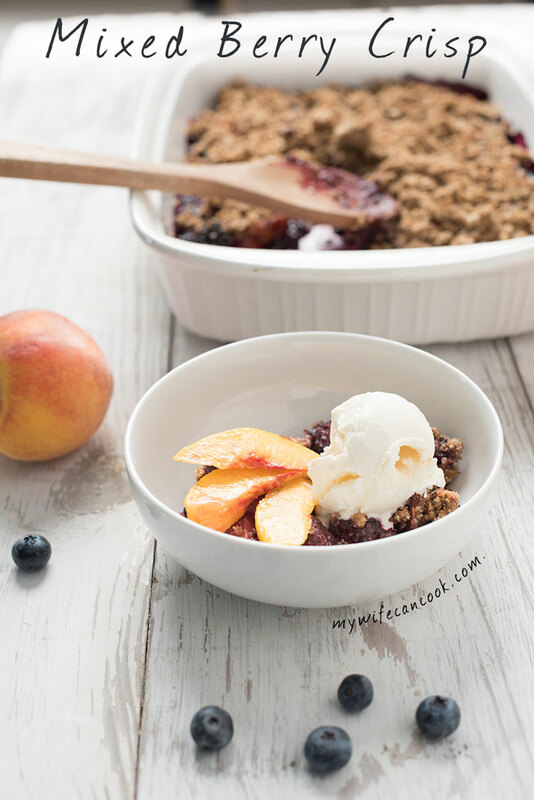 If you visited the blog be for you may have seen our blueberry crisp or apple crisp recipes and you may know how much we love crisp. It’s just the perfect dessert incorporating fresh fruit. And the crisp topping is irresistible. Add a scoop of vanilla ice cream to top it off and…well…that’s just about as good as it gets! We love how easy it is to try different variations and toppings based on tastes and dietary needs. 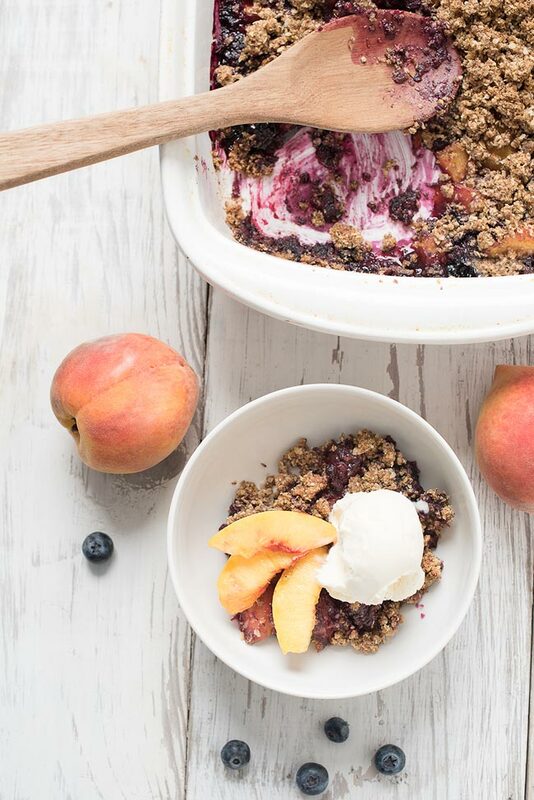 Today we’re serving up our gluten-free (blueberry-peach-blackberry) berry crisp. I’ve been making multiple trips per week to our local farm stand. Blackberries, blueberries, and peaches are still fresh, local, and amazing this time of year! We all love fresh fruit and eat a lot of it, but we also try and stock the freezer with frozen fruit. And, of course, why not make some fresh berry crisp? But, what to make? Peach crisp sounds amazing. 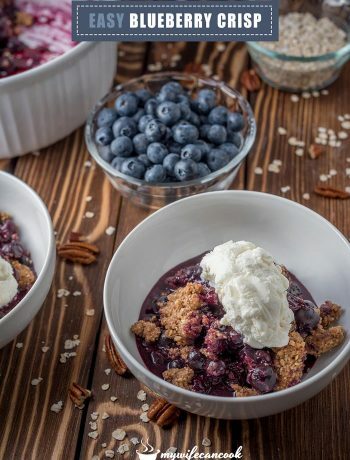 We absolutely love blueberry crisp. But, I was also interested in trying a fresh blackberry crisp? As I mulled the endless berry crisp possibilities I realized I would never be able to decide on just one. 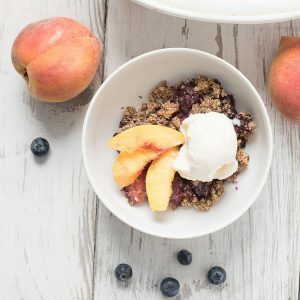 So I started considering the different fruit combinations: peach blueberry crisp, blackberry peach crisp…they all sounded great and so we decided for a mixed berry peach crisp that used peaches, blackberries, and blueberries. Because why not? 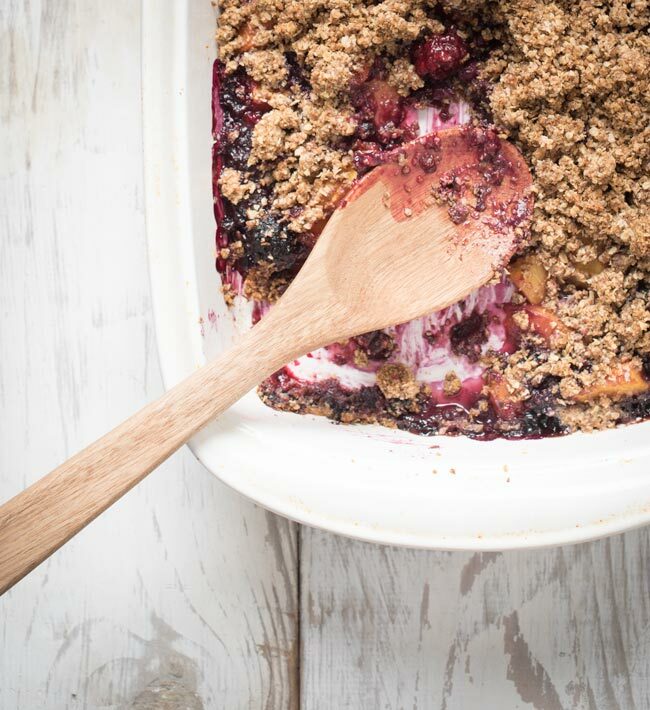 Once you have your crisp recipe perfected there are endless fruit crisp combinations that you’ll want to try. Coming up with a gluten free crisp recipe was pretty easy. The topping is pretty similar to our other crisp topping, except that we subbed out all the flour for ground flax. If you don’t like the flavor of ground flax or want to use less, you could also use less flax and add in some of your favorite nuts (I’ve tried with walnuts and pecans). I have also used gluten free flour instead of flax as well (although, I must say I don’t like the kinds that are heavy on the chickpea flour). If you are looking for a vegan crisp, I have also used earth balance instead of butter. I’d like to test it out with coconut oil sometime soon also. Then, eating it for breakfast would be perfectly acceptable, right? Tip: If you are looking for tips on peeling your peaches, check out our peach salsa post. Otherwise, leave the peels on, it still tastes amazing! Choose local in-season fruit – It’s hard to be local in season fruit and it’s also a great way to support your local growers. Experimentation – It takes practice to make the perfect crisp to your taste. I find you have to mix long enough so that it starts to clump. Experiment and you’ll find your own sweet spot. 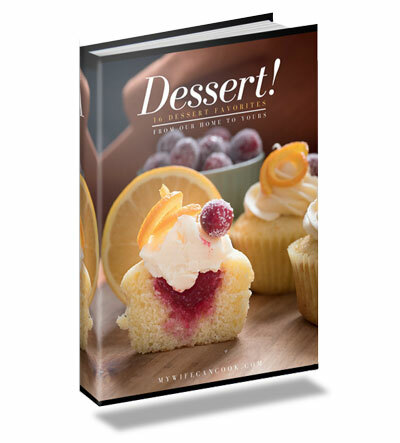 Top with ice cream – Hot crisp paired with ice cream…oh my…it just pairs so well together. 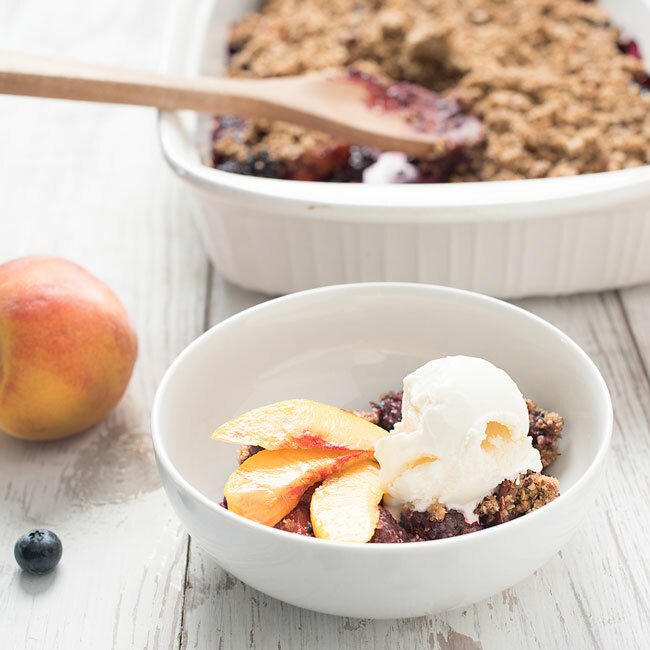 Share with friends and family – All desserts are best shared, but fruit crisp especially really is a great family style dessert that works well for gatherings. Mix together fruit, 1 T. brown sugar, and cornstarch or almond flour if using (make sure you thaw fruit if using frozen). Pour fruit into greased 8x8 inch pan. Add all topping ingredients to food processor and pulse until mixed. Cut butter into 8-10 pieces and put on top of mixture in food processor. Pulse until mix clumps together and not powdery. Empty topping evenly on top of fruit (break up any large clumps). 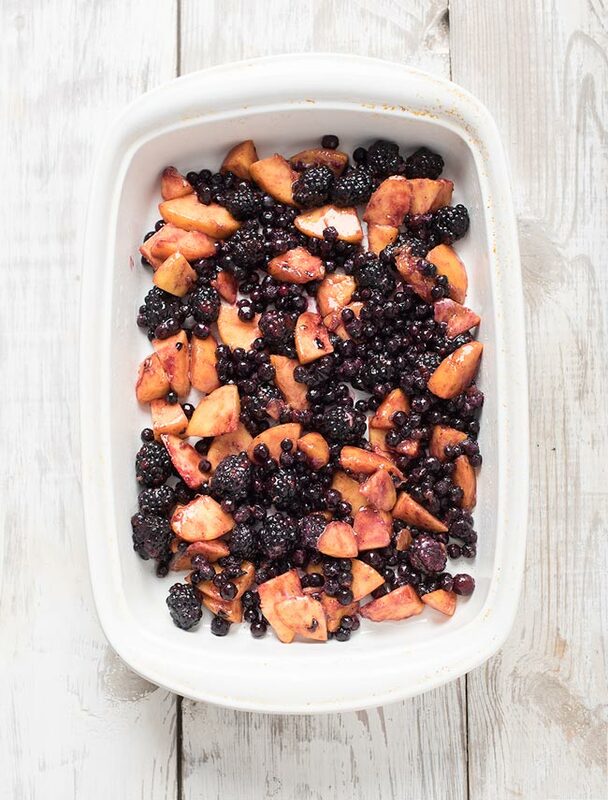 Bake for 40-45 minutes or until fruit is bubbly and topping is browned. I’m with you – I hate making pie! Crisp is always the way to go. Love the addition of flax to your gluten free crisp topping. Thanks! I tried making my grandmother’s apple pie and the crust was a disaster! I will stick to crisp! I grew up on fruit crisps (or fruit crumble as we call it in NZ!) and it’s my all time favourite dessert. Yours looks absolutely divine. I want to jump in the photo and take a bite..!! Thanks! I love how easy it is to throw together! What lovely pictures! I wish I could grab a spoon and dig in through the screen!!! You are right! 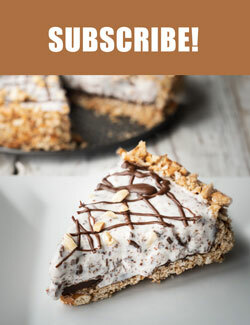 This is so much more easier than pie! 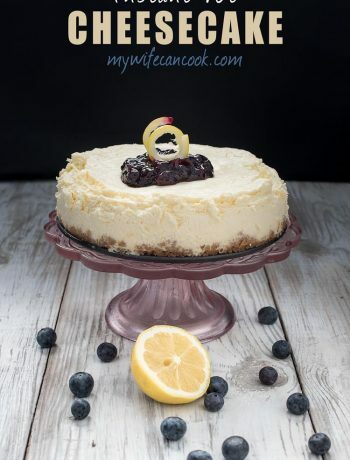 No rolling, shaping, cutting, prebake…. and just as delicious! Thanks! It really is so much easier. Gorgeous PICS! They just reel me in one after the other. I just need a spoon to dig in. YUM!